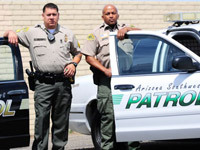 Arizona Southwest Patrol was founded in 2011, and has quickly become one of Yuma's premier security service providers. We are locally owned and operated and offer a wide range of services from uniformed armed patrol officers, to posted standing security officers. We are fully licensed, bonded and insured security providers. We assure that your valuable assets are protected to the utmost degree. "In fact, a team from the Joint Chiefs (of Staff) came through and did an assessment. When they left their comment was, 'without question, this is the most secure joint-use base we've seen.'" Protect your family, property and community with advanced security solutions from the experts at Arizona Southwest Patrol. Our officers are all equipped with radios and maintain constant communication with dispatchers and patrol supervisors. Continuous communication between officers and patrol supervisors gives our standing officers immediate assistance should a problem arise. Patrol supervisors check on standing officers during all shifts. ARIZONA SOUTHWEST PATROL is the way to feel comfortable with your security. Our company was built on and upholds five set principles. Using principles combined with our staff's expertise in security patrol, make us the most dependable security company in Yuma. Integrity: We strive to retain high moral principles and professional standards with our clients. Knowledge: With law enforcement and military experience, our staff has a clear awareness of the task at hand including the quickest and safest resolution. Teamwork: We work together with our staff and community to provide a safer environment of everyone. Courage: Our well-trained staff encounters every altercation with utmost respect to all parties involved.